What’s Up WIth The Abbey Lofts? Remember back in 2011 when I wrote about the Foundry Lofts at 1100 Lansdowne Avenue, comparing to Alcatraz? Remember the fallout thereafter? It seems as though any time I write anything negative about a building or an area, residents decide that opinion has no place on the Internet, and that a corresponding legal action would be celebrated worldwide. In any event, I want to discuss 384 Sunnyside Avenue, and try to determine why this building doesn’t sell well. On paper, this should be one of the most sought-after lofts in the city. 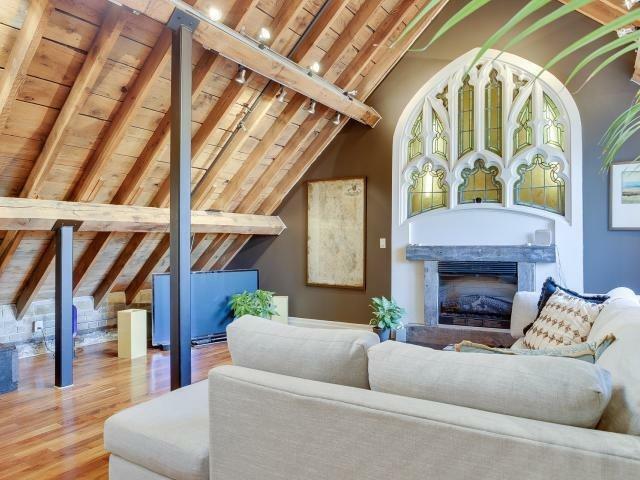 It’s a converted church, so units are full of unique features, from exposed brick, to stained-glass, to timber beams. It’s in Roncesvalles, which is an awesome neighbourhood. And it’s only 24-units, so the basic tenets of supply and demand would tell us that these units are exceptionally rare. But all the while, I continuously see units in this building hit the market, and then sit. There’s a unit currently listed for sale that has been on the market for 20 days. It has previously been listed five times for 41, 30, 20, 20, 20, and 29 days respectively dating back to June of 2018. In between these listings, another unit sold after only 9 days on the market. Previous to that, another unit sold after only 8 days on the market. But then we have another unit listed for 33, 61, and 54 days before it finally sold. You would think that a unit with all this original character and charm would do well, but it didn’t. And price was only part of the issue. I’ve come to the conclusion that some of the units are absolutely gorgeous, and others suffer from design flaws that are bound to be present in any conversion. There’s one small skylight above the TV area, and then to the right of that skylight, above the beam, there is what looks like another window, but that’s actually natural light coming from the second floor. Then the two stained-glass windows behind the dining room are poorly-placed, since they’re basically cut in half by the level separating the 2nd and 3rd floor of the building. Those windows don’t open, and you can’t see through the glass. So in the end, you can’t go outside, or even see outside. “I would never live in a condo where I don’t have a glimpse of the outside world,” my client told me. And I realized that I think this is the only condo I’ve ever been in without an actual window you could see through. It was like a solid box. This is a bad example of a unit in the building, but there are plenty of good ones. This building is actually one of my favourite hard lofts in the city, and it remains my favourite church conversion. 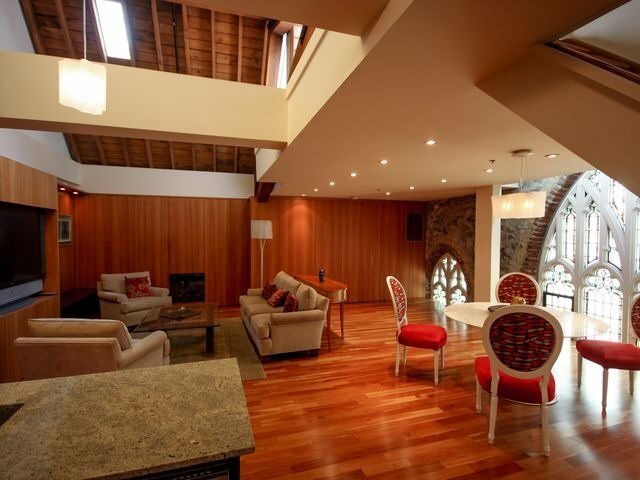 I love the location of 660 Pape Ave, but for character – I would choose the Abbey Lofts. It’s just odd how well some units do, and how poorly do others. If you didn’t hear about this already, you’re clearly not in tune with real estate in New Brunswick! What do you think would happen if a town, say, somewhere in North America, was offering land for $1.00? Do you think most people would assume there’s a catch? A man is reading the newspaper, and sees an ad for a Ferrari for $2.00. He mulls it over, and finally figures he has nothing to lose, so calls the number, and sets up an appointment to view the car. He arrives, sees the car is for real, meets the seller and sees that she is for real, and offers $2.00 for the car. Well in McAdam, New Brunswick, population 1,225, plots of land really, truly are for sale for $1.00 each. And guess what? They received over 600 inquiries! Sixteen plots of land, ranging in size from 7,100 square feet to just under 12,000 square feet, are up for sale in efforts to boost the town’s population. The town has selected a handful of applicants already, primarily retirees and families. They don’t want developers to build, and/or flip; they want residents who will add to their community and economy. It seems this once-proud railway town has fallen on hard times, and instead of licking their wounds and lamenting their misfortune, the folks in McAdam decided to get creative, and actually do something about their problem. It might work, and it might not. Hey, it’s only sixteen plots of land, after all. But the story itself sure got the town publicity! And you know what they say about publicity. What if we could find a way to really, truly prove that two plus two isn’t four? A colleague asked me to help price a condo the other day, and address the massive discrepancy between the $1.4M she felt the property was worth, and the $1.7M the sellers sought. She gave me the rundown of the property, and one thing really stood out for me: the condominium came with four owned parking spaces. Four! Who in the world needs four spaces? You might ask, “Need, or want?” and that’s exactly the theme here. I told her, “No, what I meant was that in total, they’re worth about $75,000.” She paused, and looked at me a little confused. If these folks purchased four parking spaces in pre-construction for $50,000 each, it does NOT mean that when they go to sell the condo in five years, the spaces are worth a sum of $200,000. In fact, because every unit in the building has a parking space, and many owners already have two, you might figure that spaces #3 and #4, in the context of this particular condo sale, are worth exactly zero. Yeah, I’d argue as much. On paper they’re worth $50,000. Just like when you buy stock for $50 per share, and hang on to it. When the stock hits $20, you haven’t lost anything, at least not yet. We call this a “paper loss,” since the loss isn’t realized. The same is true for these extra parking spaces, in a building where there is no need, and no demand. As I alluded to above, I’m always amazed at how some people in society view the cans and cant’s of life, especially when it comes to sharing thoughts and opinions. I filmed a video of a unit I owned in 150 Sudbury Ave almost a decade ago, and that video remains in the annals of the World Wide Web for anybody to see. In the video, I lambasted the developer, Urbancorp, as a prelude to several more years of critiques, before they finally declared bankruptcy, further justifying everything I had ever said about them. That video, I would like to think, helped dozens of buyers avoid not only the pitfalls and risks associated with buying from Urbancorp, but also buying in pre-construction in general. Many people make money in pre-construction, but many people get burned beyond recognition. “A fool and their money are soon parted,” and developers prey on stupid pre-con buyers. I recently received a page from my office to call John So-And-So, with the reference “your blog.” This could mean a lot of different things, as I’ve learned over the years! Sometimes, it’s a new client. Sometimes, it’s a sales call. And sometimes, it’s a complaint. This story involves one of those times. He proceeded to tell me that he owned a unit in that building, on that floor, and wanted to sell. He said that in multiple YouTube searches, this video, or links to it, had come up. He felt that the video could have a negative affect on the value, and/or marketability of his unit. “But what about the hundreds of people who watched the video over the last decade and learned from it?” I asked. “What about all the people who learned that developers aren’t your best friend, or that Urbancorp were awful developers, or that pre-construction ‘investing’ isn’t as simple as it sounds, and comes with all kinds of risks?” I asked again. I sighed, and wondered why people think the world revolves around them. He grasped at one last straw, making some weak attempt at a legal argument, and I told him that I had to take another call, but to keep in touch if he had any questions about the building, or if there was anything I could help him with. I don’t understand people out there. He didn’t just want me to remove this video, he really, truly felt that it was unjust. Every year, thousands of movies are made in Hollywood, and thousands of critics give their reviews, and opinions. Food columnists dine out at restaurants, and write about their salads. And nobody threatens to sue them for expressing their opinion. But if I wrote that I don’t like a certain building, people send letters to my brokerage. Do you remember what real estate was like before DocuSign? At first, my ears piqued up, as I thought of previous snowstorm-related-deals, and smiled at the prospect of another. As amazing as DocuSign is, and as many hours as it has saved us Realtors, for a moment I felt a sense of loss. Because never again will I be on the receiving end of an amazing deal because I was able to trek through the snow and present an offer to a seller who’s scheduled “Offer Night” was brutalized by the weather. The last time this happened was on Cranbrooke in March of 2016. You guys know who you are! The TREB numbers are out on Wednesday. I have a prediction for you – the media will make the story about sales plummeting, when all the while, the true story is lack of inventory, and sales dropping is merely a by-product of the true issue. Why Don’t People Want To Move?